Here at Bill Plemmons RV World, we are proud to offer superior customer service by going above and beyond. As a result, we are excited to announce that we have received the RV Business Top 50 Dealer award again for 2017! In addition, we are the only RV dealer in North Carolina with this Top 50 Dealer status. 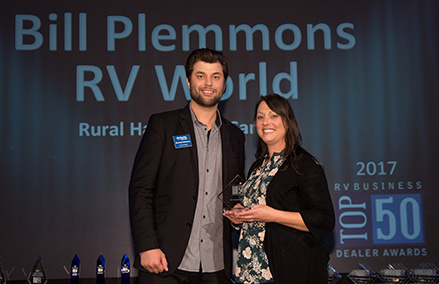 This year’s roster of RVBusiness Top 50 Dealer Award recipients was released by RVBusiness magazine and its marketing partner BJ Thompson Associates and included Bill Plemmons RV World. All of the named U.S. and Canadian retailers were publicly recognized on stage again this year at a gala Nov. 8 awards reception during the Recreation Vehicle Dealers Association International Convention/Expo co-hosted Nov. 6-10 by the U.S. Recreation Vehicle Dealers Association and RVDA of Canada at Bally’s in Las Vegas. In fact, as BJ Thompson pointed out, the 10-person panel of independent industry people that met to review the applications in early September at the RV/MH Hall of Fameindicated that they were impressed at the applicants’ overall approach to a series of topics that repeatedly surfaced throughout their responses. Among them were the challenges of locating and training service technicians, an increased attention to service issues, the growing embrace of technological change, the ongoing debate over parts availability, the current push for improved PDI and product quality control, and the adoption of new advertising formats and communication tools – i.e. social media. Here (in alphabetical order) is a rundown of this year’s honorees in an industry-wide program sponsored by Ally Financial Inc., Cummins Power Generation, Airxcel’s Dicor Corp., Dometic Corp., Freightliner Custom Chassis Corp., Lippert Components Inc., NTP-STAG, Protective Asset Protection, Truma and Wells Fargo CDF. Affinity RV Service, Sales & Rentals – Prescott, Ariz.
Alliance Coach – Wildwood, Fla.
Alpin Haus – Amsterdam, N.Y.
Big Country RV – Bend, Ore.
Bill Plemmons RV World – Rural Hall, N.C. Contact Us at Bill Plemmons RV World to experience award winning RV Sales, Service and Finance!